How Much Wood Pellets Does One Burn Over The Winter? This is a common question. Unfortunately, there’s no easy answer, especially if you’re a new pellet stove owner. There are a number of factors involved, such as the stove brand and model and the quality of the wood pellets themselves. If you’re looking to completely replace all other heating sources and you live in a cold climate, you could easily use 3-5 tons of pellets each burning season. The number of tons is heavily determined by the size and shape of your house (see our article on Sizes of Pellet Stoves) and whether you have a tight building envelope with good insulation. If you’re simply looking for a supplemental heat source or occasional use, 1 ton may be sufficient. However, the quality of wood pellets and the stove itself affect how much total heat you’ll get out of your pellets. If your stove is less efficient and you use low-quality pellets, you’ll need more. Regardless of how many tons you use, the good news is that wood pellets are generally very easily available throughout the heating season from multiple retailers. 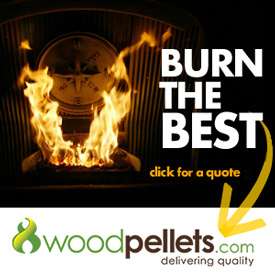 Check WoodPelletPrice.com to stay on top of availability and pricing. If you have wood pellets left over from the heating season, they can be burned next year. They may absorb a very small amount of moisture, but assuming they are kept out of the elements and not moved 13 times, they will burn just fine the next heating season.